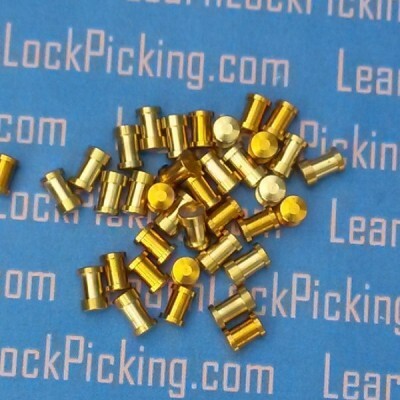 The 6 pin version of our lock picking practice locks. 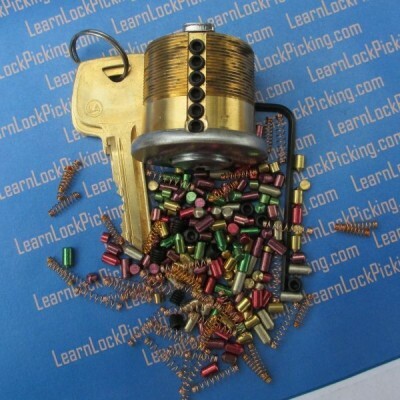 Pin stack retainer screws make it easy re-key this lock cylinder to thousands of different key combinations for thousands of different lock picking challenges. An assortment of extra bottom pins, top pins, master pins, spool pins, and springs is included. SKU: 6-Pin-UCL. Category: Practice Locks. Brands: LearnLockPicking. 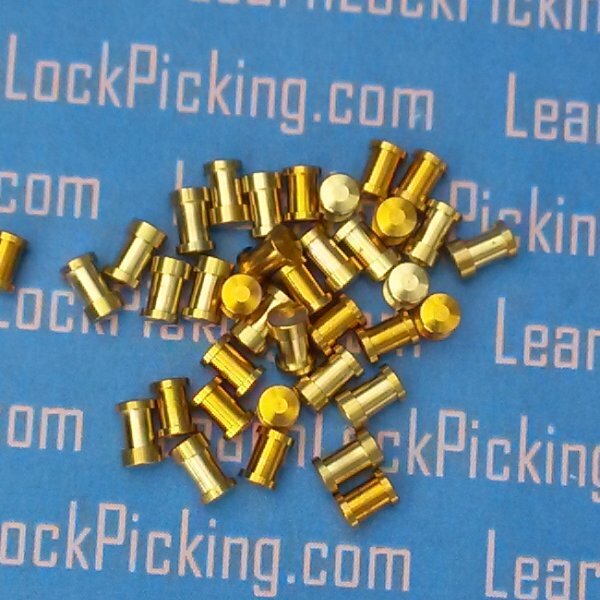 The 6 pin version of our lock picking practice locks. Pin stack retainer screws make it easy re-key this lock cylinder to thousands of different key combinations for thousands of different lock picking challenges. An assortment of extra bottom pins, top pins, master pins, and springs is included. Also included is a 5 pin demonstration key with it’s own pins to let the beginner demonstrate a lock’s normal operation before re-pinning the lock for lock picking. 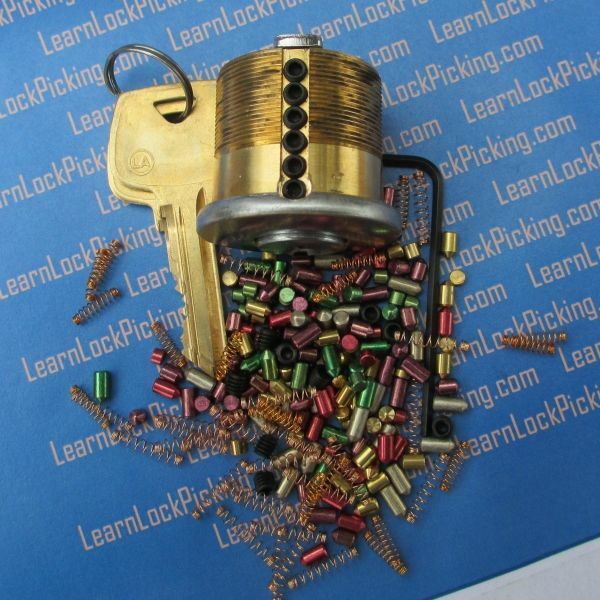 This 6 pin Challenge version of our practice lock also includes an assortment of spool pins so you can learn to overcome pick resistant cylinders. Special security pins are becoming more common every year. A decade ago, security pins were rare. Today, even some of the cheapest hardware store brands include security pins to make them pick resistant. The most common type of security pin is the spool pin. Most locksmiths never develop the skills to consistently open these locks. With practice, you can learn to consistently open even pick resistant locks. 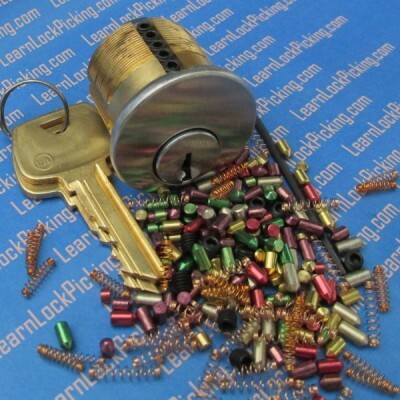 The Ultimate Practice Lock Products were invented right here and were the original products offered by LearnLockPicking.com. 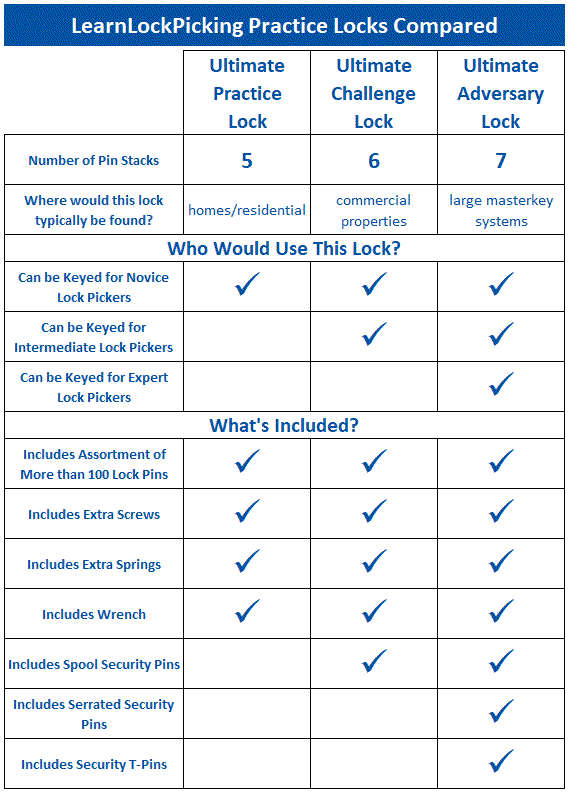 Today, thousands of our practice locks have been used to master the skill of lock picking in over 40 countries. I love the idea here but a lot of us are beginners and we need more help on how to pin stack correctly, if you don’t do that correctly and know what sizes to put together far as key pins and driver pins the lock won’t open and you with think it’s your skill level but actually you have wrong sizes in pin stacks. Please fix this issue buy color coding driver and key pins that are stackable together! I wanted the 6-pin challenge – and I GOT it! No easy pickin’s here. But the availability of being able to quickly reconfigure and practice with different feels is very much more valuable than having a dozen different locks that I’ve picked hundreds of times each lying around. Practice, practice, practice. Well done!! Brand new to locksport. This is a great practice set with so many options and can scale with you as your skills advance. Good price, good quality, super happy. The lock was delivered within a week and is exactly as described. I am new to this sport and was getting proficient at cheap padlocks like Master locks so thought this would be easy. That isn’t the case for me. This has given me hours of practice at a variety of configurations. Usually I can rake it easy enough but SPP is much harder with this lock. Still haven’t advanced to the spool pins that are included but with practice feel I can achieve those eventually. I would recommend this to anyone trying to learn lock picking. I found most of the key pin/driver pin combinations are so short in the one I got that pinning combinations are limited (because the key pin and driver pin combined don’t stick out of the Bible) or have to be master key pinned which adds multiple sheer lines making the lock super easy. I personally would not purchase again. I’m glad I found this lock. 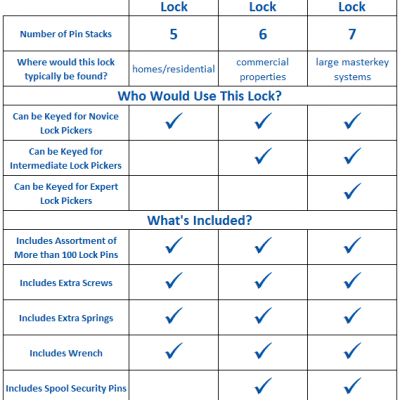 I recently took up lock picking as a hobby and soon realized that I was going to be buying a lot of locks. When I bought this lock, I knew it would save me a lot of money. I received an large number of different pins and springs with it. I can change the pin configuration a thousand different ways. This lock will save you some bucks and is a great aid for learning. Before I knew that this existed, I was spending a good amount of money purchasing padlocks from Wal-Mart, then returning them once I had picked my way through them all, as an attempt to teach myself how to lock pick. The very same day I found out about this product, I purchased it and waited ever so anxiously for its arrival. What I found out when it arrived is that, all that time spent picking those “borrowed” padlocks effectively taught me nothing. Sure, I was picking said padlocks, but I had no idea if any of them contained trick pins, and that type of information is the difference between mastery of this art and forever remaining a novice. With this kit, I was finally able to expand my knowledge, having the ability to gut the lock after conquering it, and see exactly what I was up against. I’ve learned everything I know about spools and serrated pins from this product alone, starting with one trick pin in the chamber, then adding a second, and so on. I could not recommend a better, more cost effective tool for teaching the beginning lock picker, or advancing the moderates among us. I have just one bit of advice for those trying to decide between the 6-pin and 7-pin locks: Don’t do as I did and ignore everyone leaving comments about the difficulty level of the 7-pin Ultimate. 6-pin is the way to go, unless you have some SERIOUS experience picking locks. The 7-pin is great (I ordered it first, and I still have it, so that someday I will hopefully have the skill to challenge myself on an even grander scale), but the size of the keyhole is so slim that the growing lock picker doesn’t stand a chance, and thus can’t progress. So don’t make the same mistake I did: start with the 6-pin Ultimate, and you will begin your strides towards mastery! 6 stars out of 5! I really wanted to love this product, but I can’t get it to work properly. I am able to pick 6 pin standard deadbolts all day long, but I can’t even rake this lock open with 2 or 3 pins, let alone SPP. It has something to due with the different pins heights as the pins are not binding or setting properly. I have played with every color of pin length, different springs, etc., but I have still not been able to arrage a simple 2 pinset that will function properly. As a product designed for a beginner that has presumably never keyed a lock before I find it a huge drawback that the pins are not color coordinated in a way so that it prevents making your pin stacks too short or too large. The company knows this is a problem as they warn against it in their little instruction sheet. It’s ridiculous that I have spent this much time just trying to get the pins to work in an order so the lock will function and I can practice. I work in construction and rekey locks all the time so why is this one function so badly? I should have just bought a $25 Masterlock 911 and repinned it with whatever I wanted. It would have saved me a lot of money, time, and frustration. Extrememly dissapointed in this product and do not recommend. Great learnpicking lock. After some time i Got it to Denmark… Iam very happy with this training lock Bought the 6 pinner its great…,, thats great stuff. For sure “!!!!! Newbie here. This is great when you first start because it allows you adjust the difficulty level just right. My wife and I are learning this together and we are both enjoying it. Not an easy lock. I have been picking briefly, but have mastered easily the clear lock, the master and abus locks of the world, and am having difficulties with this one. Which is what is supposed to happen. If you can already lock pick well, this is not for you. Get the 7 pin, which is just evil. But the 6 is a superbly made and designed device, and it is going to continue to teach me how to pick locks. The product is exactly as described.High quality and works perfectly for the purpose it is intended. Being in Australia I was also surprised at how quickly it arrived.I would recommend this training lock to anyone. Cheers. Very nice product! This is actually my second LearnLockPicking training lock. I bought the 7-pinner first, and love it, but wanted to try a different keyway, since most of my locks have the Schlage. As it turns out, the bitting on this one (for the key that came with it and standard drivers…natually you can change it) is more challenging than my 7-pinner! Love it! This is a great product! It is really helping me learn! Highly recommend for people new to the sport! Love it. Solid quality, super easy to re-pin. Fast delivery. Bought this item recently. Great way to learn how to pick locks. Unfortunately the finish was fairly poor, the face’s coating had chipped away in places prior to arrival and there are also a couple of minor cuts in the brass. Overall I’m a bit disappointed with the finish but it does what it says it does so thats cool i guess. Great lock with tons of extra pins and springs to practice with. This is a great product. It has made easy to transition to picking multiple pins. You receive a great many pins to build up numerous combinations. It is a great kit. I discovered these via Bosnian Bill’s website & youtube channel and bought two. (One for a friend so we can set each other little challenges and swap locks every once in a while.) I’m very happy with mine. I’m pretty good at picking all five pins of the “default” setting that came with keys and have just started to try other random combinations of pins. Fun! Not disappointed. This lock is exactly what I hoped it would be. I also ordered the “security pin upgrade.” Along with all the pins it came with, this should keep me busy for a long time to come. Really impressed. Very nice quality. Good precise feel on all components. Nice packaging and the shipping was fast. Definitely recommend. My 6 Pin Ultimate Challenge Practice lock arrived this week (prompt delivery thanks). It’s a fantastic quality product. It’s like the Lego kit of practice locks. I love the way I can configure it in so many different ways with different levels of difficulty. Well worth the money. Highly recommended! Exactly as described, loads of spare pieces for future fun. I can’t think of a better way to learn this art. I can rake many locks now but am stuck still trying to single pick just 3 pins on this lock. Maybe someday I’ll get to five? Very impressed, great way to learn. As a novice I was able to start slow and get a feel for manipulating the pins. Now I spend most of my free time trying to stump self with unusual and difficult pin stack combinations. Couldn’t be happier with the product and the service provided. This is an amazing product…..period. Fast shipping and customer service. Lots of fun. High quality lock, many pins to beat. Wide learn possibilities – from easy to master skills. Short delivery time (7 days to Europe). Great lock! One lock that can be easily re pinned with a GREAT selection of pins. Could not be happier!